In the last post, I discussed a patient who had impaled himself on top of a wrought iron fence.The questions revolved around proper management in the field. Here are my thoughts. First of all, the patient stays impaled until delivered to the hospital. This will require a fair amount of creativity, as outlined by the comments by Medic97 in my last post. There are two main components: extrication and transport. The two are closely related. Extrication will require some heavy equipment not carried by your typical EMS prehospital providers. The fire department or other agency can bring the equipment to the scene. I’ve actually seen rescue teams raid nearby construction trailers for tools! It then boils down to finding the best spots to cut the fence while protecting the patient. Cutting equipment vibrates, gets hot, and can potentially cause abrupt movements of the fence. Shielding or bracing appropriate to the type of equipment being used is very important. Analgesia and sedation are encouraged. And once the piece of fence is detached, moving it and the patient in unison takes quite a few people. The last challenging task is getting the patient into the rig (transport). Make sure that the section of fence removed will actually fit through the rear door while attached to the patient. If this is a problem, it’s easy to trim off sections at this point to allow a fit. The other difficulty is securing the patient for the ride, mainly because they may not be able to assume the usual supine position. I’ve seen patients who had to be transported on their side or even prone because of the orientation of the foreign object. Once again, creativity is the key! Finally, call ahead and notify the emergency department. This will allow them to plan ahead for positioning and imaging needs, and will let them get an OR ready for eventual removal of the object. 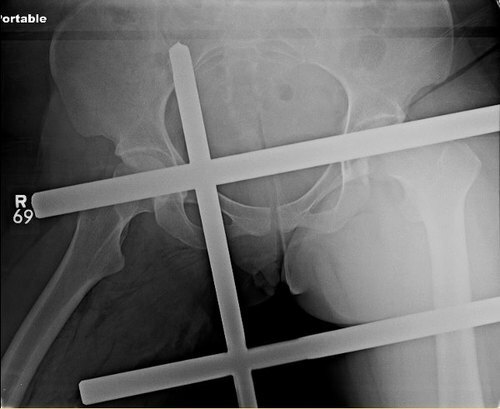 The fence posts went over and under the right femur, with the lower one impaling the posterior thigh and the upper one resting on the groin. Tomorrow, I’ll finish with some tips you can use once the patient arrives at the hospital.